They were two of the biggest Bulls questions coming into the 2017 season. After the season opener in Minnesota, the answers are positive and encouraging. Saturday, at least one of those questions will really be answered. After struggling all of 2016, the Bulls defense had to improve against the run. 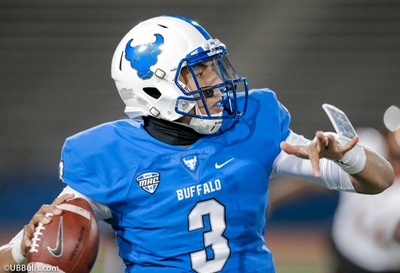 With mostly the same players back, the UB defense took a big step forward last week. They held the Gophers to 3.3 yards per carry. Minnesota’s outstanding backs Rodney Smith and Shannon Brooks never broke free. Their longest run was 16 yards. The pursuit was excellent, and the Bulls tackling was some of the best we’ve seen. They will need to do that all again Saturday against an Army triple-option attack that was 2nd in the NCAA in 2016, and ran for 513 yards last week against Fordham. Big question #2 was UB’s wide receivers. The top three from last year were gone, and there were a lot of new, untested players in the group. Well, Anthony Johnson is a no longer new and certainly not untested anymore. His breakout 11 catch debut was two shy of the school record. He showed size, speed, hands and athletic ability the Bulls haven’t had at receiver since the glory days of Alex Neutz and Naaman Roosevelt. It’s just one game, but these two encouraging signs could have a lasting impact on the rest of the season. Bull Session Trivia: Anthony Johnson is from Rock Hill, SC. That’s a suburb of Charlotte, NC and just over the state line. Two former Buffalo Bills first round draft pick defensive backs are also from Rock Hill. Can you name them? What a way for Khalil Hodge to warm up for the Army game. The Bulls linebacker had a career-high 20 tackles against Minnesota. That was the most tackles by a Bull since 2008 when Davonte Shannon had 20 vs. the Black Knights. Hodge ran to the ball, stuffed the run, and never let a Gopher out of his grip…This week, Hodge figures to be even busier. As the middle linebacker, he’ll be in charge of making sure the Army fullbacks don’t run wild up the middle. 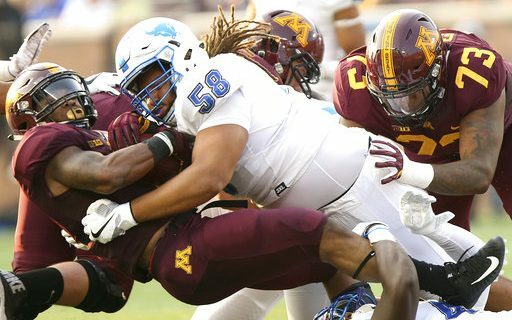 Last year, Hodge had 16 tackles vs. Army…Hodge got a lot of help from defensive tackles Justin Brandon and Chris Ford, who were outstanding stuffing the middle. Again, they will be huge against Army…Tim Roberts had a career-high 13 tackles. The Exterminator looked very comfortable stopping the run…Cam Lewis was another star on defense. He was tested often by the Gophers athletic receivers, and his end zone interception was one of the game’s biggest plays…Army won their opener without completing a pass. They were 0/2. That’s not unusual. If Army is playing their game, they don’t need to (or want to) pass…Quarterback Ahmad Bradshaw ran for 177 yards, including a 71-yard touchdown. He had 129 yards on the ground against the Bulls last year…Most of the time, Bradshaw wants to hand the ball to fullbacks Darnell Woolfolk and Andy Davidson. Nearly every play starts with a fake or handoff there. Then, Bradshaw will keep and run or pitch to one of the slotbacks who follow behind him. The Bulls controlled those backs in 2016…Army’s offense returns 10 starters from last year. The Black Knights are one of the few NCAA teams that run the triple option offense. Navy and Georgia Tech are among the others. It’s unusual, and that makes it hard to prepare for. The Bulls have the benefit of playing Army for the second straight year, so the defensive players are used to the style and the speed of the triple option. But the UB coaching staff also went back to their Division III days to craft a game plan. Defensive Coordinator Brian Borland came with Lance Leipold from Wisconsin-Whitewater. At the Division III level, many more teams run the triple option and even the old wishbone. For the Bulls defensive coaches, Army’s triple option isn’t all that uncommon. They have a good handle on how to stop it. That showed in last year’s Bulls win, when the UB defense controlled Army’s ground game as the game went on. Bull Session Trivia Answer: Bills first round draft picks Jeff Burris (1994) and Stephon Gilmore (2012) are both from Johnson’s hometown of Rock Hill, SC. The Bulls receiver actually works out with Gilmore in the off-season.